Here are the pictures of Elam and Sarah Hitchcock Ives and their house in Mt Carmel, CT (a section of Hamden). 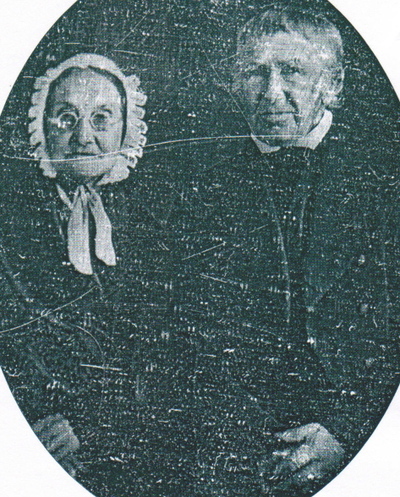 It was taken around 1840 when they had been married nearly 50 years. Thanks to Jim for this photo and several others which will appear soon. See the post, Ivesville and Ives Corner, Connecticut - Elam Ives founder, for more on Elam. I heard from David Nelson that one of his daughters was Bede or Beda Ives, born Dec. 31, 1793; died May 17, 1818. She married David Bradley after 1810, and had at least two children before her death in 1818. She was one of 11 children that included another Elam and a William Ives. He found information on Elam Ives and his children from information taken from the DAR application of his granddaughter Helen Ives Webb, National #73228. Elam served as a volunteer in the defense of New Haven, CT at the time of Tryon's invasion in July 1779. He purchased a four acre lot in 1787 and built a small house (95 Ives Street, Hamden, CT) before his marriage in 1790. See the next two posts for pictures of his house. Bill, wonderful image of Sarah and Elam Ives, must be an early daguerreotype photograph. David N.